Pecan Crusted Salmon for the win! This super easy and healthy fish recipe will be a hit with everyone at your dinner table. 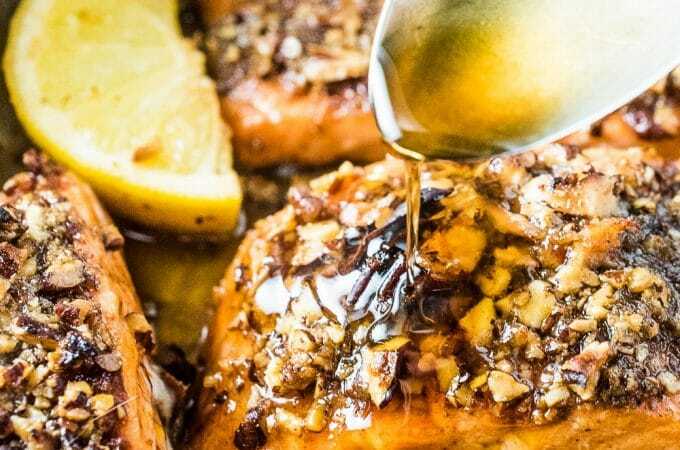 The salmon is seasoned then coated in toasted pecans and cooked in a delicious maple glaze. You will love it! I've made a few adjustments to the original recipe in order to bring it into the times. Back in 2012, I had used panko (fancy breadcrumbs) in the recipe. 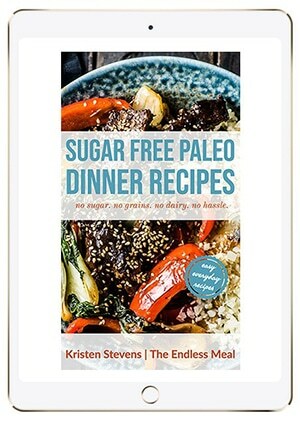 This time, I wanted a gluten-free and paleo fish recipe so I kicked the panko to the door. I honestly don't know why I used it in the first place as the fish is awesome without it. I've also made a super easy glaze because glazed salmon = awesome. By cooking some garlic and ginger in a little butter (or olive oil for dairy-free!) then adding a splash of maple syrup, you create a sauce for the salmon which is out of this world delicious. It also smells AMAZING as it cooks. Mmm garlic! Damn, it feels good to be back in my kitchen! 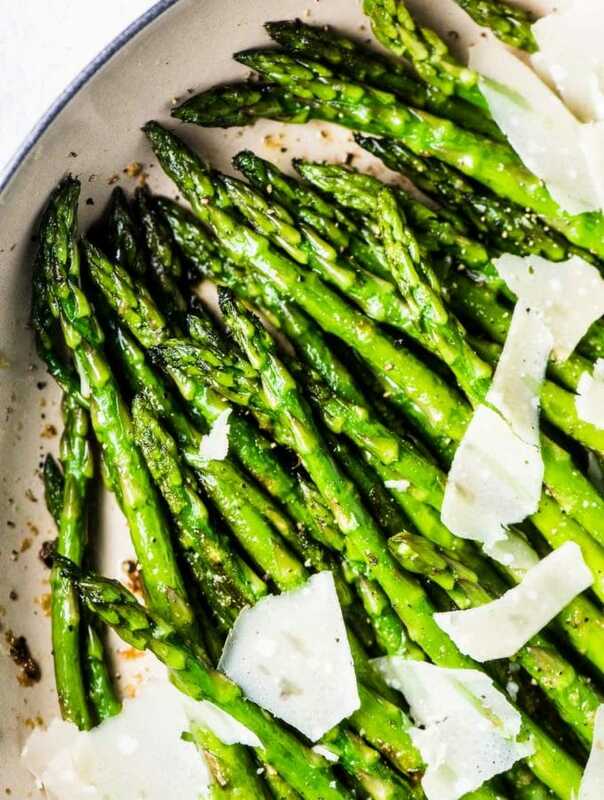 I know I already said that when I was sharing the recipe for asparagus with you, but it seems worth repeating. Don't get me wrong, it's not that I'm super excited to be back home (I've never been ready for a holiday to end, no matter how long I've traveled for.) It just feels good to cook again. For the past two and a half weeks, I've been wandering slowly around Belize and Guatemala. I say slowly because, especially in Belize, they walk slowly. Really slow. Barely moving kind of slow. It's my kind of pace. On Tobacco Caye, a tiny island off the coast of Belize that's covered in white sand and palm trees and surrounded by coral reef, they've basically stopped moving. I spent three days there nearly at a standstill, only moving just enough to put on my fins and snorkel before floating in the water or to nudge the sand with my toe to make my hammock sway again. I was going to draw some sort of parallel between this pecan crusted salmon I just made and the red snapper and barracuda we were fishing for at Tobacco Caye. But trying to liken a plastic wrapped salmon fillet to a brightly colored fresh fish caught in turquoise water is a bit silly. Not that the salmon isn't good (it's delicious!) but it's not the same as catching your own under the hot Belizean sun. 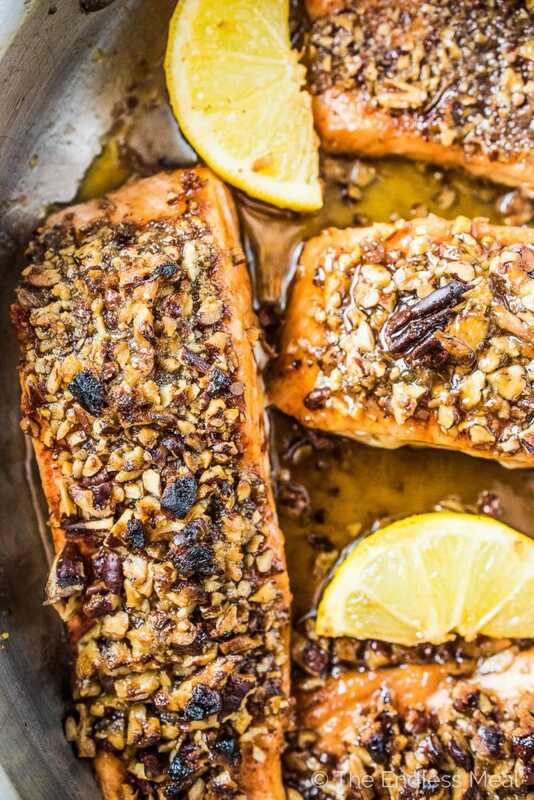 The pecan crust adds a rich, nutty flavor and crunchy texture to the salmon. 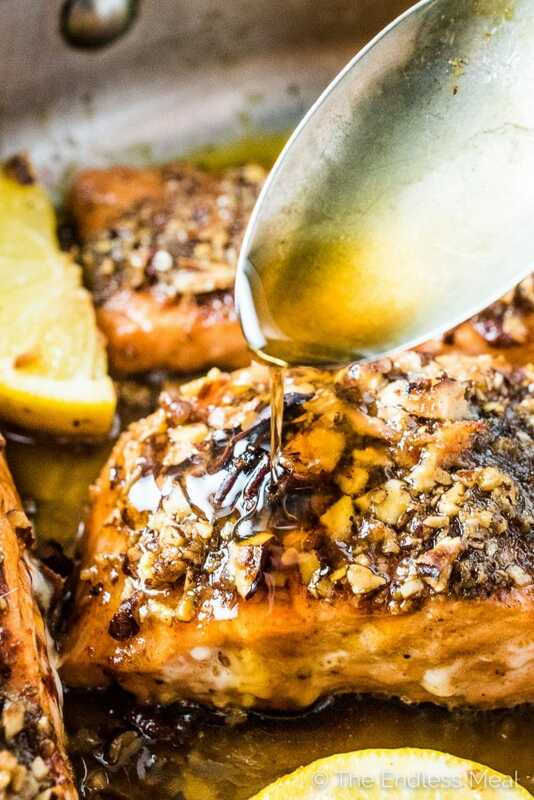 Don't skimp on the oil, it'll help keep the salmon extra tender so it will melt in your mouth. You can make the topping ahead of time and keep it in your fridge until you are ready to use it; it will last a long time so go ahead and make extra to keep on hand until the next time you make this pecan crusted salmon recipe. Place your oven rack in the top third and turn to broil. Place the pecans on a baking tray and pop them into the oven to toast. Don't wait for the oven to come to full temperature or it will be too hot for the pecans. Put them in right away and take them out as soon as you start to smell them, about 5 minutes. Let them cool for a minute then finely chop them. Drizzle the olive oil over the salmon fillets then season them with sea salt, paprika, and pepper. Use your hands to rub the seasoning evenly over the fillets. Divide the pecans between the salmon (on the tops only) and pat down gently. 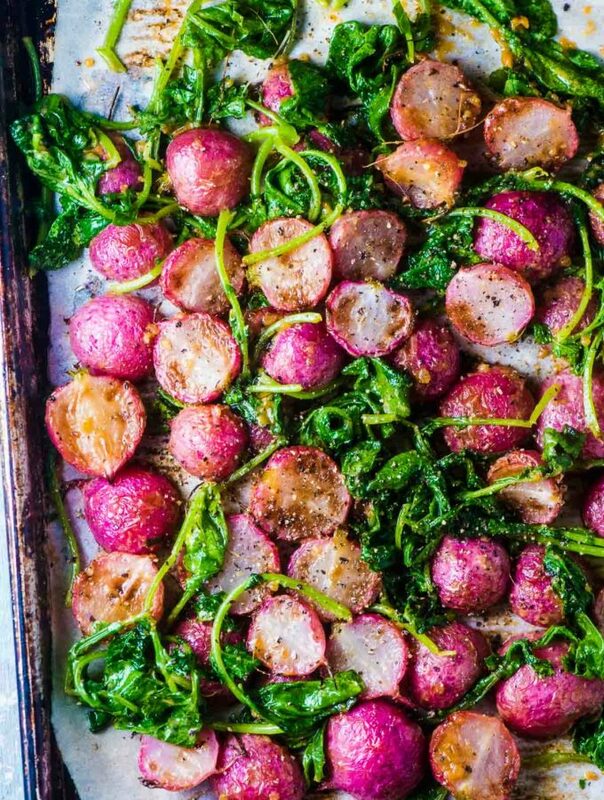 In a large, ovenproof frying pan, heat the butter or olive oil. Add the garlic and ginger and cook for one minute. Add the maple syrup to the pan and bring it to a boil. Carefully add the salmon fillets to the pan and nestle the lemon wedges between them. Spoon some of the sauce over the fillets. Cook the salmon for 4 minutes then transfer the pan to the oven and broil for 2-3 minutes, or until the tops have browned. Serve immediately. This salmon is also excellent served cold with a salad for lunch. Meal prep! 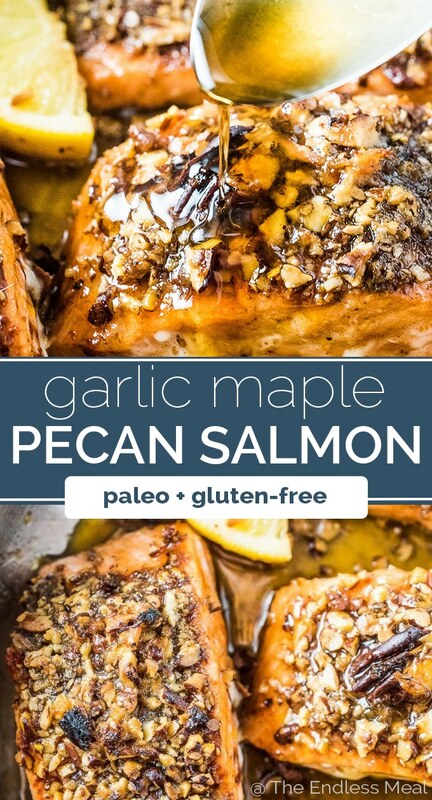 I was going to make the salmon pecan maple glaze recipe but there are 2 ingredients listed twice (garlic and ginger) but the instructions don’t mention adding them twice. Is is a miss print? Or can you explain. I don’t want to over do on these two ingredients. You’re right, it was a typo. Thank you for catching that! This salmon is so good! And that sauce is everything. This is going on regular repeat. Thank you! So happy you found a go to recipe! I totally agree. There is no place like home! Wow! Belize looks beautiful and a lot like paradise. Hope you didn’t get burnt in the hot sun. I love salmon and I love pecans so I must try this recipe. Thanks, Vita! Belize was incredible beautiful. If you ever get the chance I highly recommend going! What a beautiful salmon recipe! Nice pictures. I would like to visit Belize. I know what you mean. No matter how fun a vacation is, it always feels better to get back into your own bed and your own kitchen! The salmon looks fantastic!